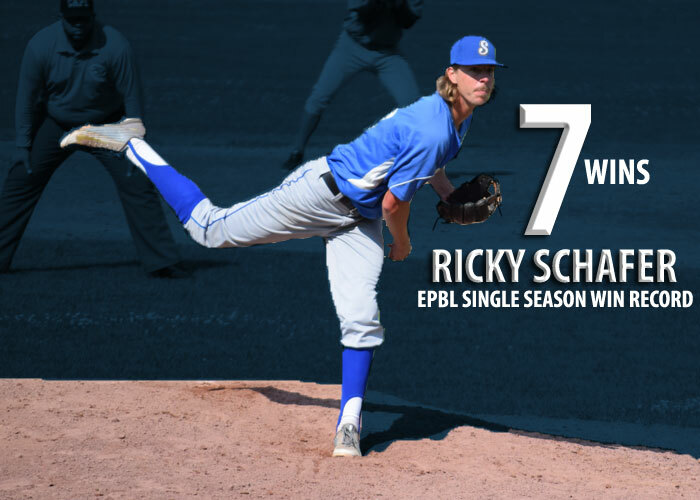 PLATTSBURGH, NY – Ricky Schafer breaks Empire Leagues single season wins record with the Old Orchard Beach Surge taking down the first place New York Bucks by a score of 11-1. The Surge starter went the distance earning his 7th win of the season. The complete game was also a leagues single season best. In the 7 innings tossed, Schafer allowed 7 hits and just 1 earned run with 1 walk and 5 batters struck out. The Surge are still hanging on in the Empire Leagues playoff race and this win was exactly what the team needed to get themselves going. Schafer improves to (7-1) in the season with a 2.44 ERA 4 complete games and 43 strikeouts in 59 innings pitched. The Surge helped their starting pitcher with 11 runs of support on 13 hits. Tony Holton went off with a 4 for 5 performance scoring a run driving in 2 runs and 2 of the hits being doubles. John Tierney, Daniel Dominguez, Quinn Tiernan and Cole Easley all had 2 hits of their own. The Surge improve to (15-19) and are only a half game out of the Wild Card Playoffs. The two teams will face off again tomorrow at 12:00pm.